I don't know about you, but I love going to the grocery store. You never know what delicious concoction you'll come upon, or what out-of-season fruit you'll find on sale. And so yesterday, when I stopped in for some bread and cheese, I strolled through the produce section in case the blueberries were discounted. They weren't, but I did come upon this interesting version of an apple. 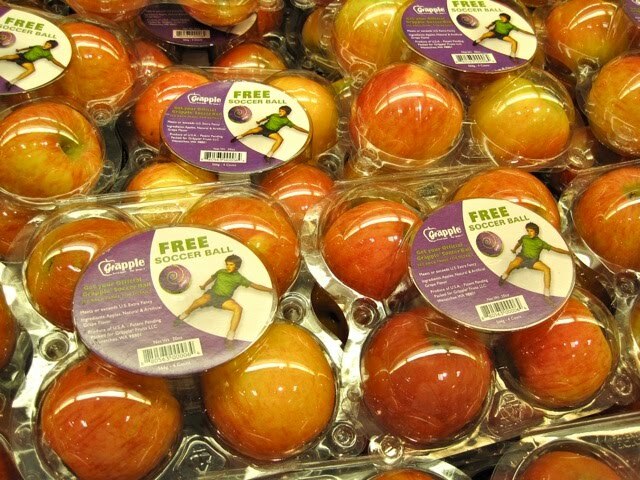 It's called a Grāpple (say it: GRAPE-ul) and when you walk by the display, you can't help but instantly figure out why. The delicious grape candy smell all but brings you to a screeching stop—it's that intense. Now, I love grapes and I love apples even more so of course I felt compelled to investigate. The Grāpple, as it turns out, is a combination of Concord grapes and Washington apples (typically Galas or a Fujis). And no, Grāpples don't grow on trees. They are yet another byproduct of our wonderful (and I use that term loosely) food industry. C & O Nursery out of Washington state, to be exact. And while browsing the Grāpple website, I found a great video that detailed the production process. It starts with those Washington apples, which are computer-picked for optimum size and density and then moved to what is best described as an apple soaker. In the soaker, the apples experience a "relaxing bathing process" that allows them to soak up the Concord juice. And by Concord juice, I'm not talking about freshly stomped Concord grapes. Rather, concentrated grape flavor combined with water. In their words—"natural and artificial flavor" that is completely healthy. Whatever that means. In my mind, I'm immediately bummed that little elves aren't puncturing Washington apples with little juice-filled syringes. And I'm also wondering if this ups the natural levels of sugar in the apple itself. However, I was surprised to learn that it didn't. 16 grams of sugar, start to finish. And so, I'm sure you join me in wondering what's really in that magical grape potion to alter nothing but flavor. And why alter the flavor of something that tastes perfectly good anyways? I'll never understand, which is why I didn't buy the Grāpples. Judging by the videos, I'm sure they taste superb. But I love my apples just the way they are, and I don't want that to change. Tell me, have you had a Grāpple? What's your opinion, even if you haven't had one? A student brought them to school last year after we talked about cross-breeding plants. SO GROSS. They smell like grape jolly ranchers. I'm sorry but no real grape smells that way. These things must be poinsonous! !